Located just a stone's throw away from Montana's capital, the Coffee Shack has a bright and inviting atmosphere. Stop by to sit in the sun and read the papers or go through the drive-through at 1323 11th Avenue for a quick pick-me-up. 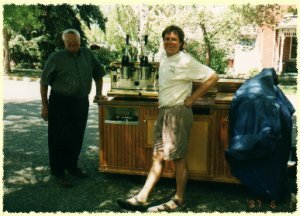 Here's me, Kevin Keeler, the owner of Montana Maid, with a friend, on a bright summer day with my portable coffee shop. I'm often at local events dispensing that essential coffee. Coffee roasting is an art and that's where you can often find me, with the custom-made coffee roaster in our basement. I am a micro roaster who is able to roast each variety of coffee bean to its fullest flavor...we create a product that is never bitter. Since we roast in small batches, our product is always fresh.